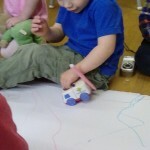 Introducing drawing and pen control the Rising Star team developed some more intriguing methods, such as using a pen strapped to a car, different paint techniques and using the story of goldilocks to inspire story maps. 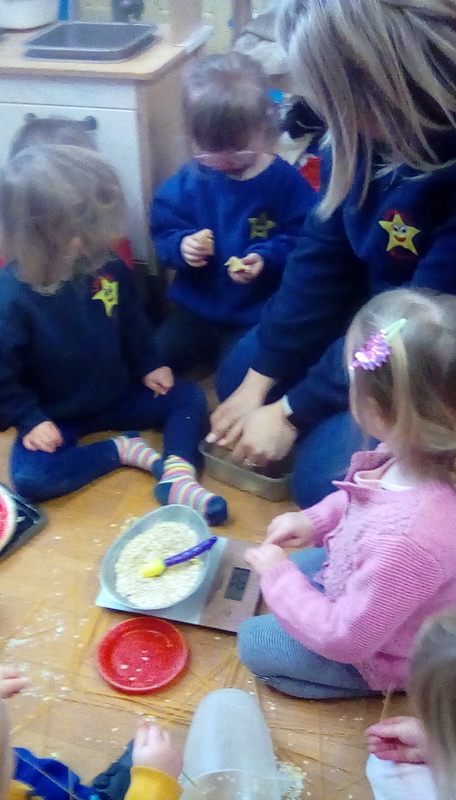 Following their training on maths for 2 year olds, Sophie and Abbie have been focusing specifically on ways to introduce maths to the very youngest. 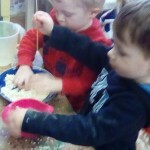 In fact the realisation is that we and they are “doing maths” all the time: in cutting up their toast for breakfast, singing songs, telling stories, playing in the sand, finding shapes out on a walk, drawing a circle in chalk on the floor, but we may not be documenting it as such, not thinking it as maths in the traditional sense. 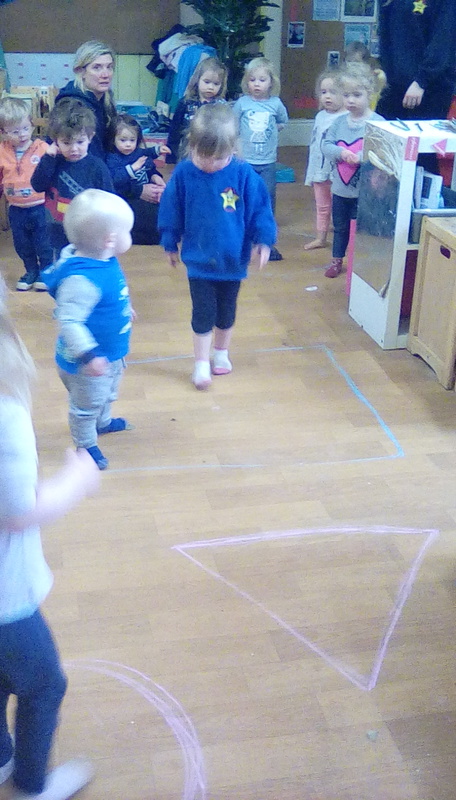 The Rising Stars have returned from the half term break to the new “active” story of Goldilocks and the Three Bears. 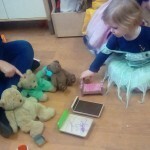 The story will again be told verbally rather than with a book for the children to engage and also with props that they can use as a visual and interactive aid, as Abbie shows in these pictures below. 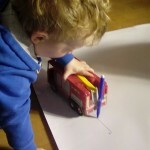 The story reinforces the “rule of 3″ in Active Story making, as well as repetition. 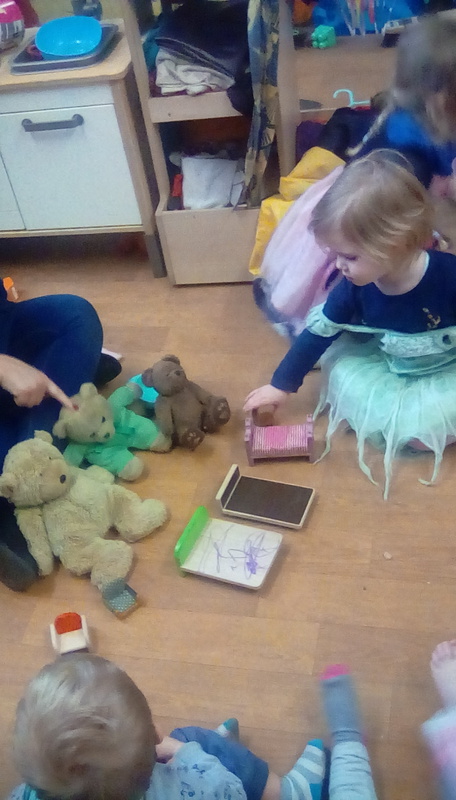 They will be able to make links with maths through size as well as thinking about families, as why should there always be a daddy and mummy bear? 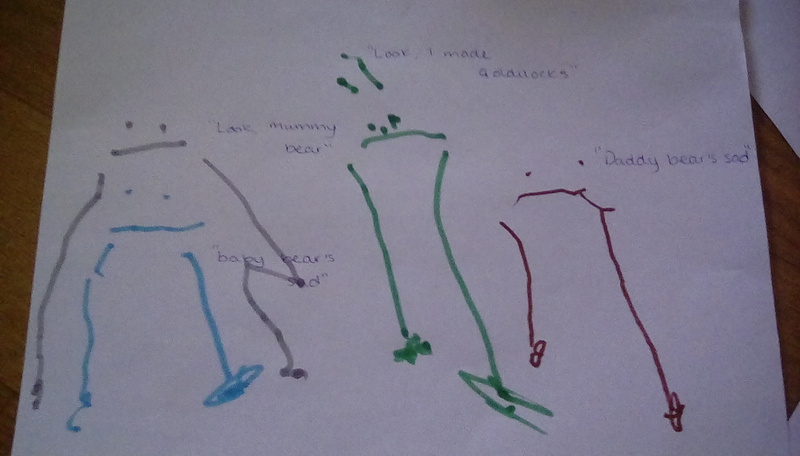 Maybe this baby bear could have two daddies or a single mum. 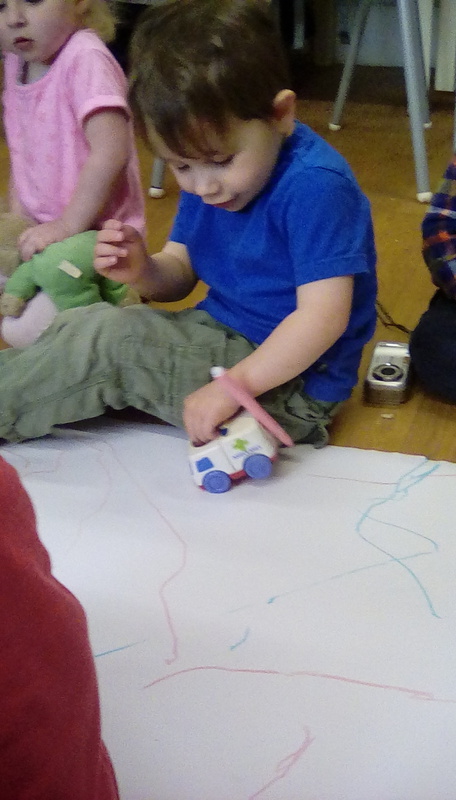 The power of speech should never be undervalued but in order to obtain the skills in order to express themselves in words, children first need all the underpinning skills of communication: play and interaction, understanding, listening and expressive language. 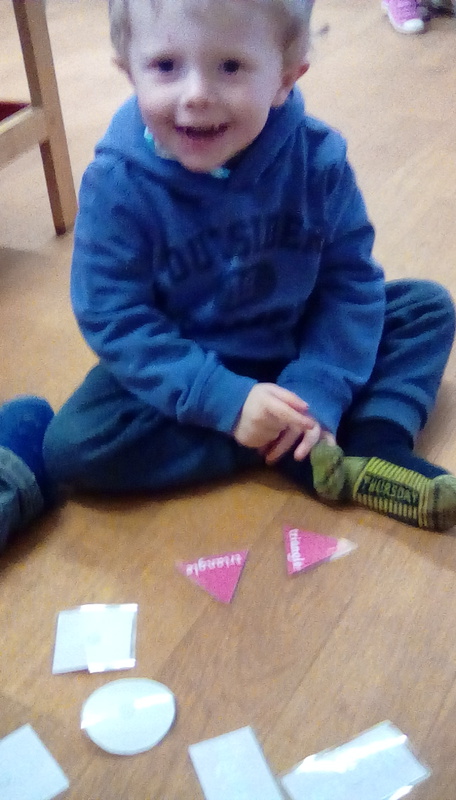 If a child is able to command all of these then they can communicate and only when they can will speech be added as the final brick on this pyramid. 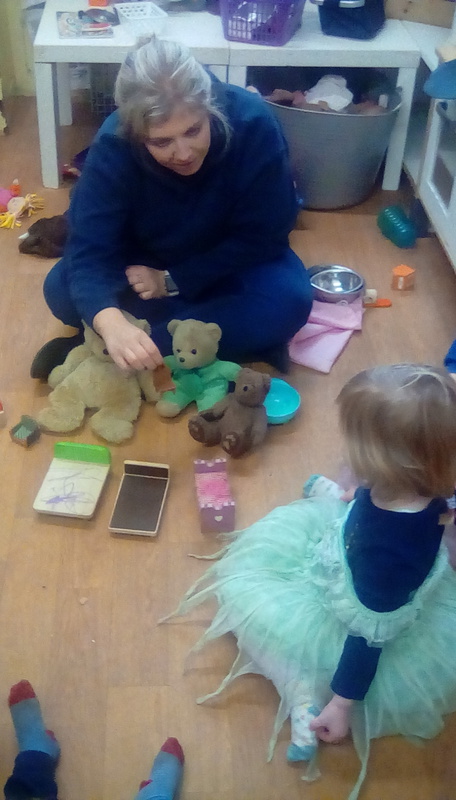 Non verbal communication is therefore just as important and powerful a step towards talking and is a tool for our youngest of children to feel valued as participants in our society. 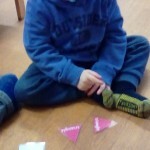 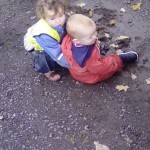 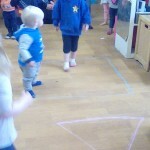 This sequence below shows just how the non verbal children can carry out their own conversation without words. 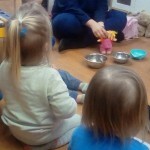 Just look at their gestures, the eye contact, the story they are telling with their hands. 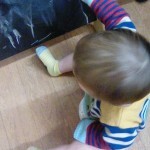 This is early talk. 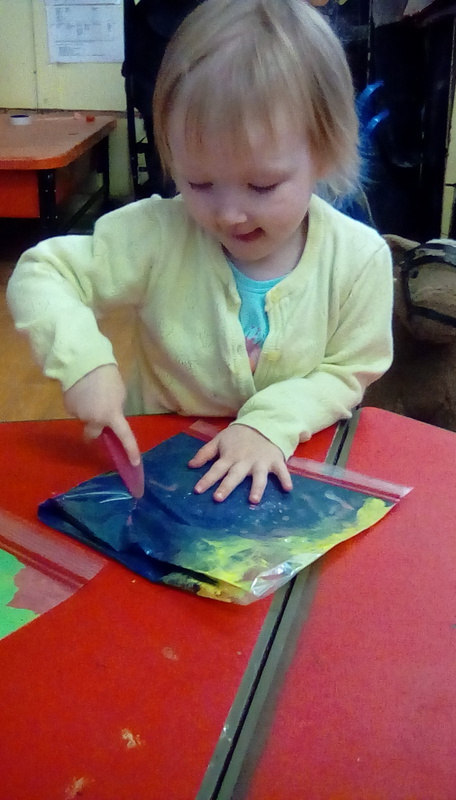 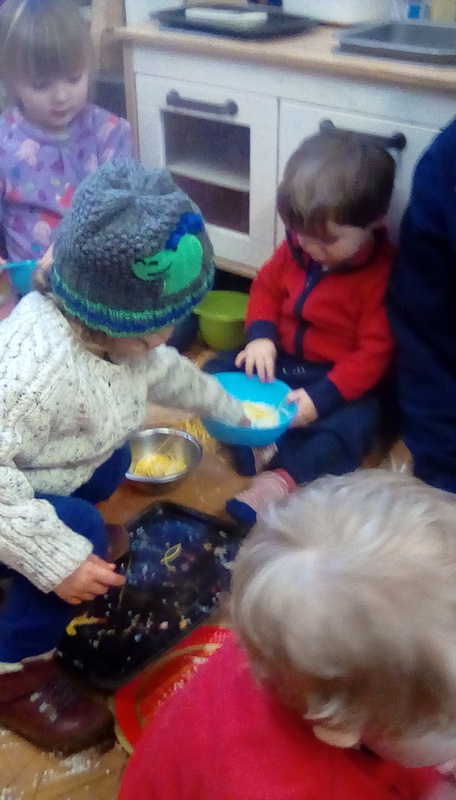 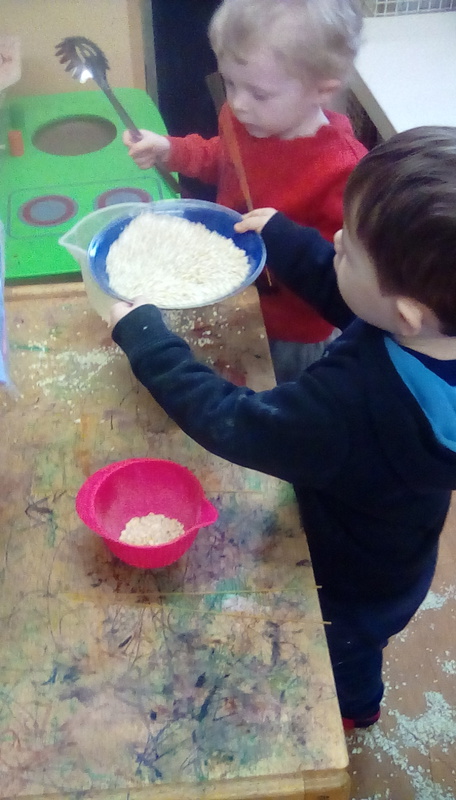 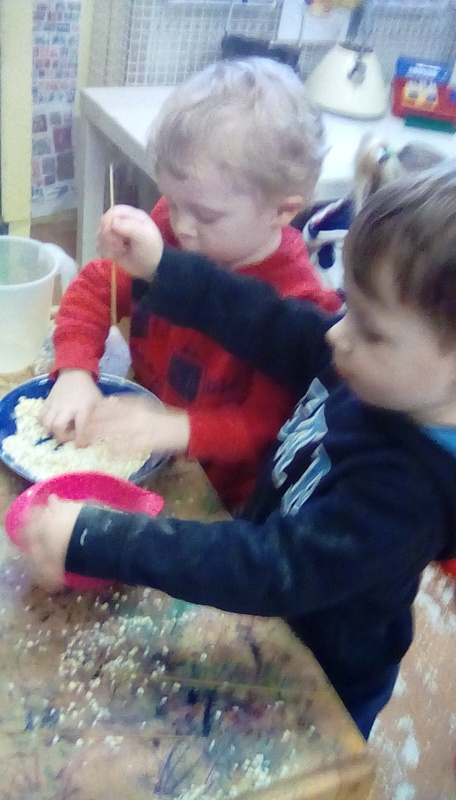 In more adult interaction this week the Rising Stars have been exploring texture, getting “hands on”, sharing and being imaginative with real food in the play kitchen. 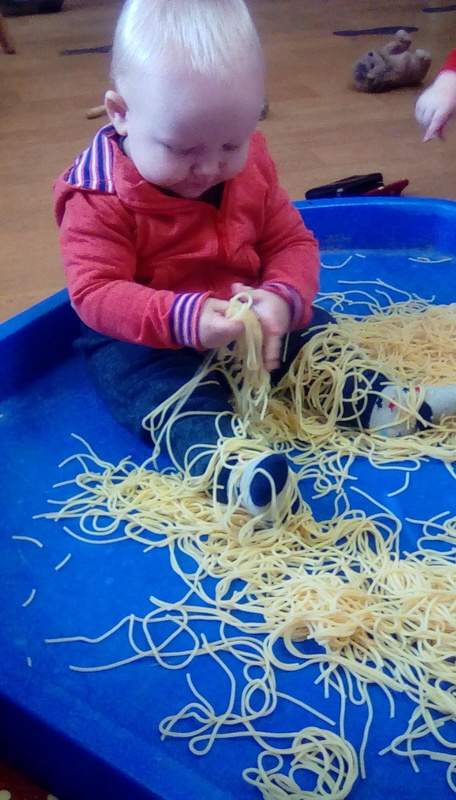 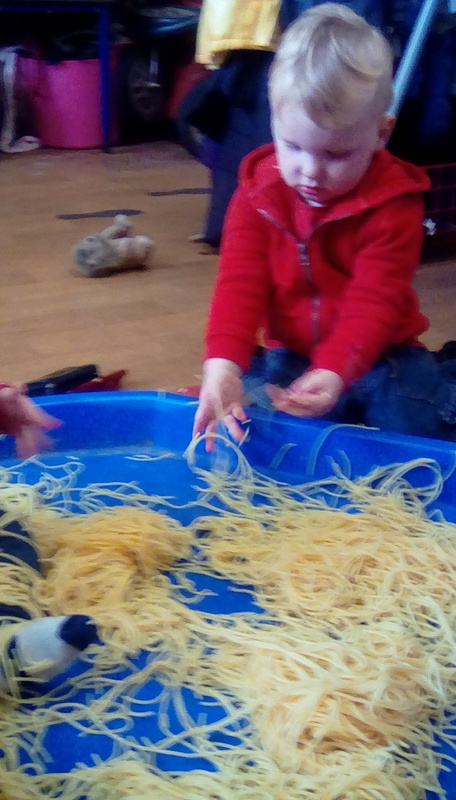 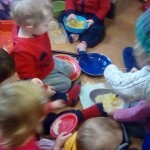 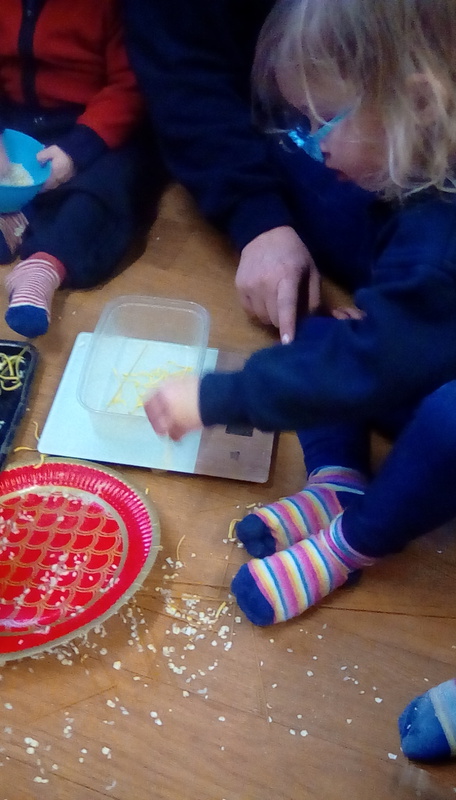 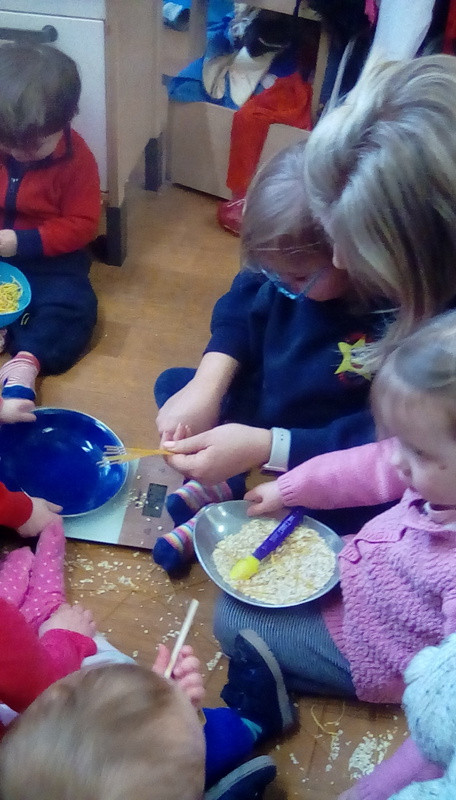 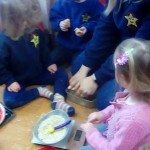 They were able to bring maths to their play through measuring and using scales; the adults gave new mathematical vocabulary such as “shorter” or “longer” when breaking the spaghetti as well as comparing quantities. 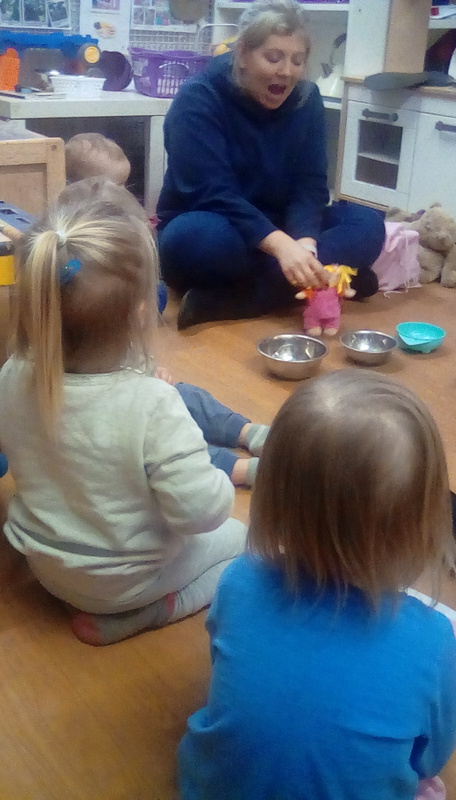 Abbie continues to lead the team of Rising Stars this term, with as ever the very able and wonderful team of Sophie and Dani plus our apprentice Chloe and also Annalise will be joining them on Tuesdays and Thursdays. 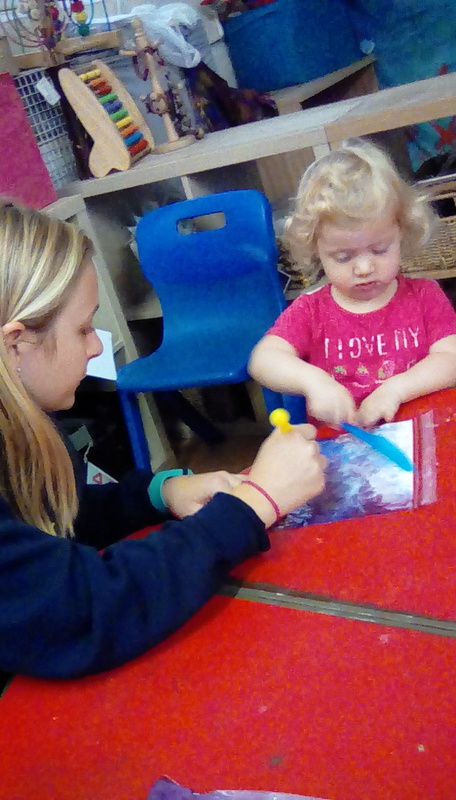 Annalise is currenty studying her Early Years degree at Bath Spa University and has already got to know some of the children as she has been spending time with us on Thursdays. 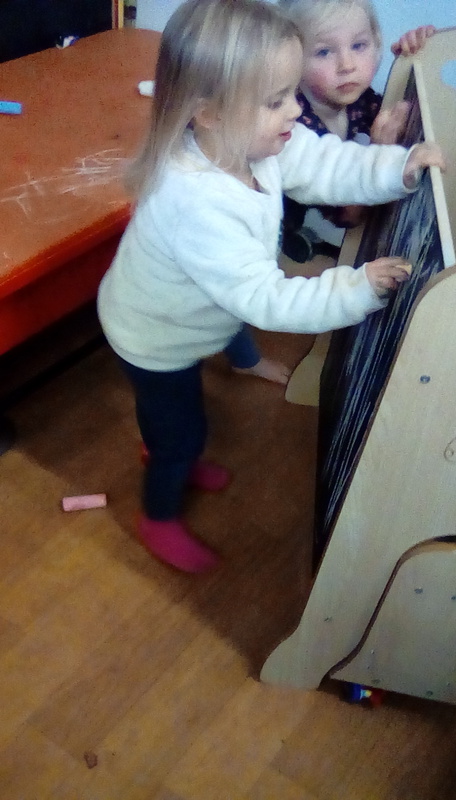 I will be updating our Staff page and notice board shortly so you will learn more about all the girls then. 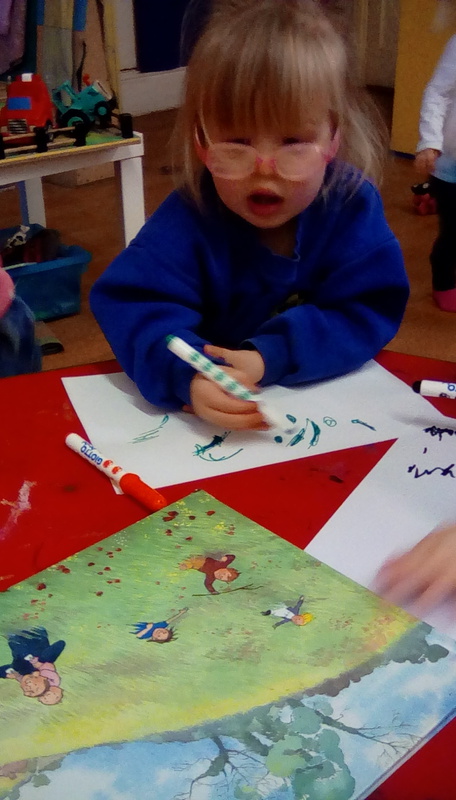 This term the Rising Star group will be fully introduced to the story making ideas as they learn ‘The Three Little Pigs’ through actions, drawings and words. 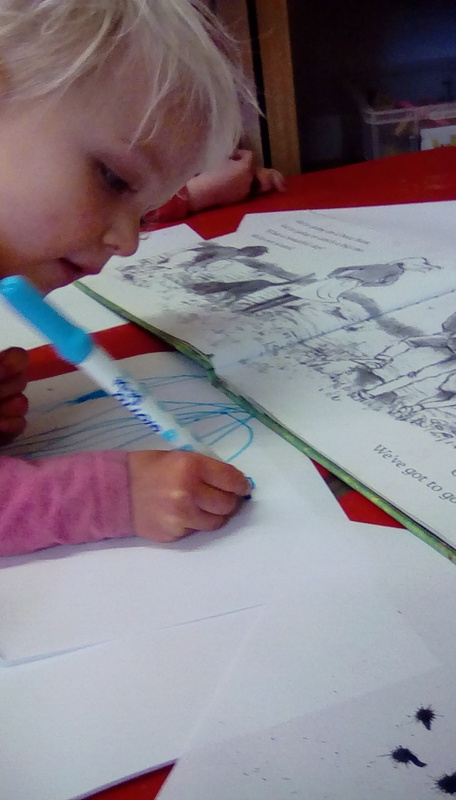 We do not use a book to start with to encourage the children to be engaged on their own level and gain a deeper understanding of language. 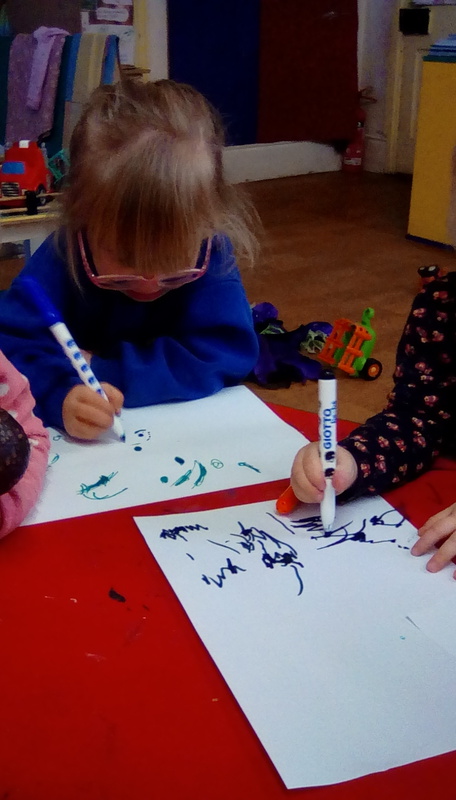 You can read more about Active Story Making as well as read our version in the documents below. 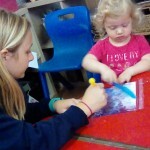 Makaton will be featuring as part of their daily routines and activities to support the verbal and non verbal. 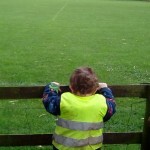 Look out for some sharing key signs as well as songs with you on this page. 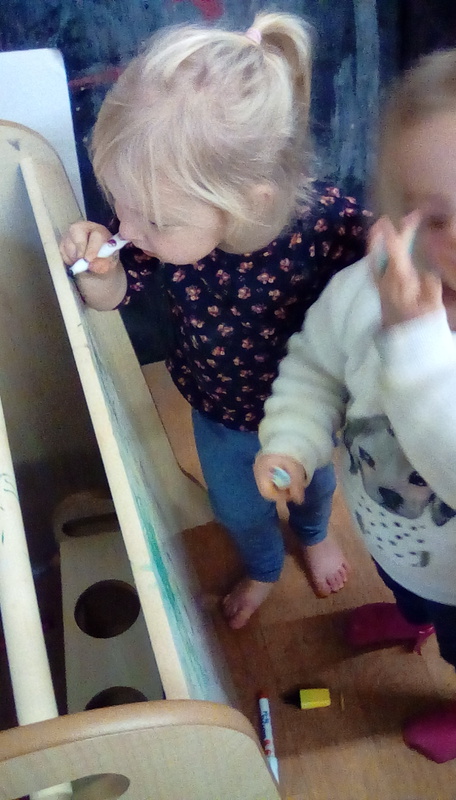 Changes to the Rising Star room that we are considering is how to make an inviting, explorative and inclusive creative area for every baby and toddler to use. 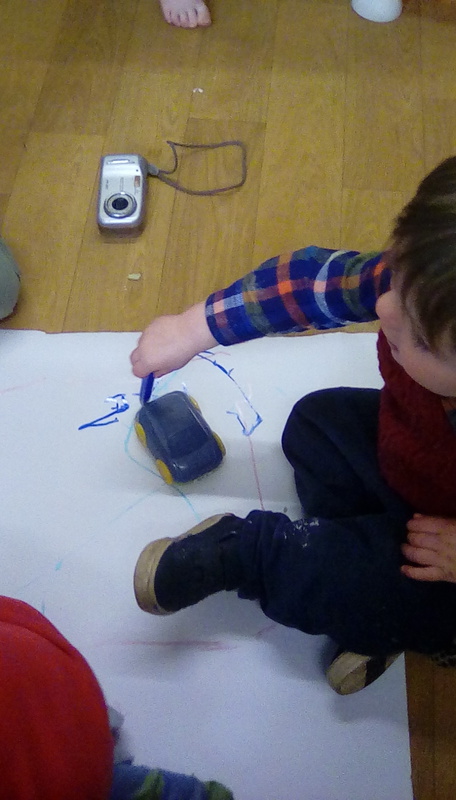 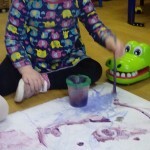 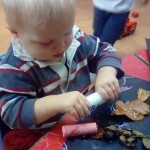 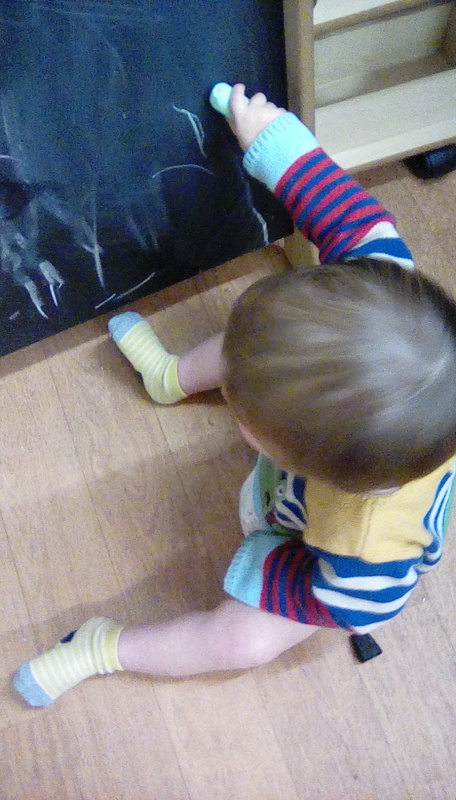 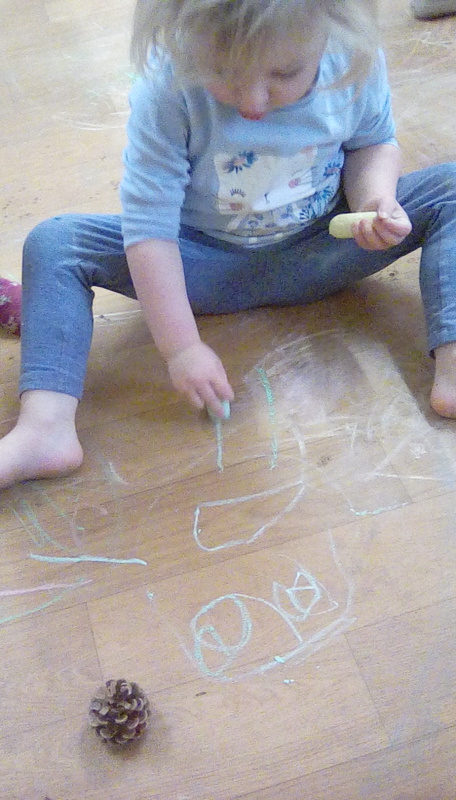 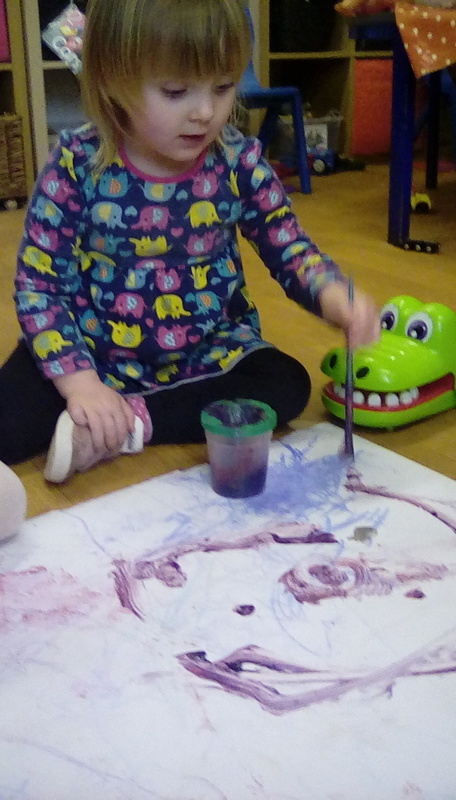 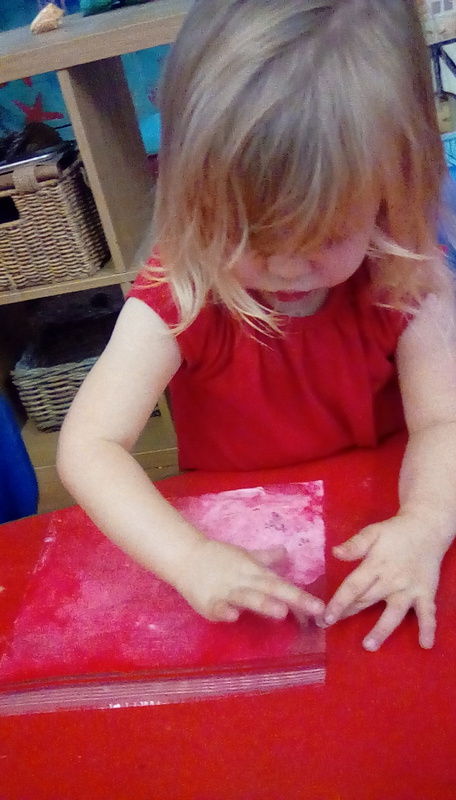 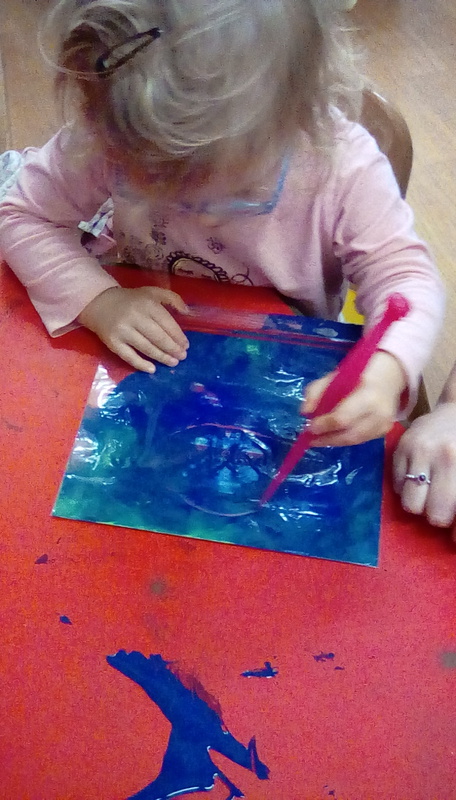 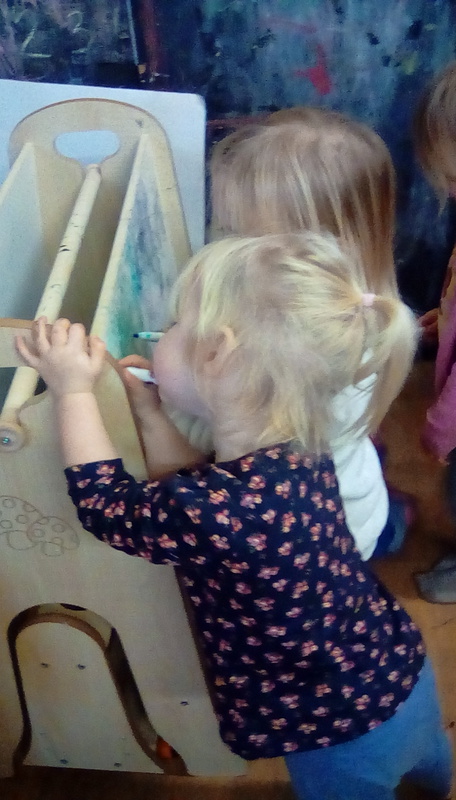 We have previously shared the value of using the toddler height easel for making their beginning marks and vertical brush strokes and we want to see how all materials: sand, water, flour, paint….you name it…can encourage lots more independent fun and development. 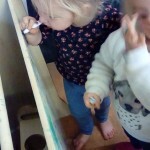 Using ideas from ‘Sunshine circles’, as well as her work with ‘what’s in my box?’ play as a student, Sophie has been helping our younger children appreciate and learn the value of being an individual whilst working as a group. 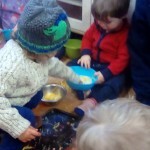 Sharing together the anticipation and joy of finding out what the adult is going to show them uses aspects of midfulness sessions in which the children get to ‘pay attention to the present moment’. 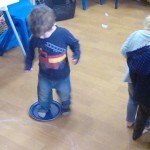 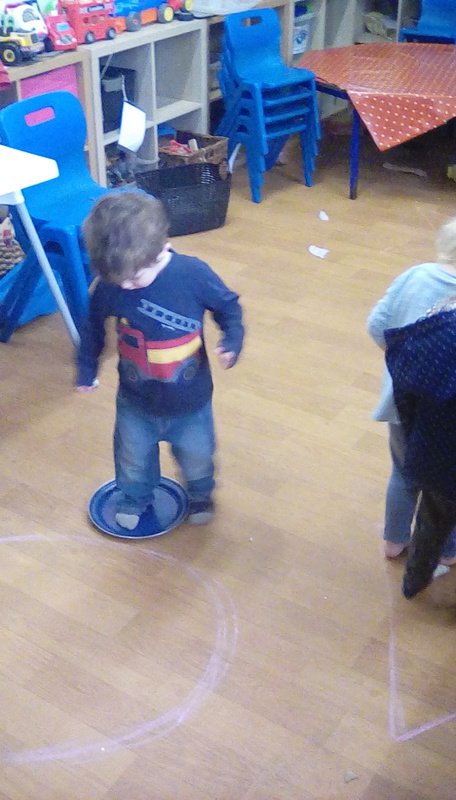 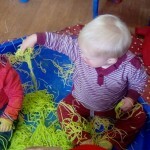 Sensory experiences of passing a ball of foam around the circle or sharing the tickle of a feather on them allows the child and the adult to share this moment with no expectations on them, with no prescribed results or outcomes. 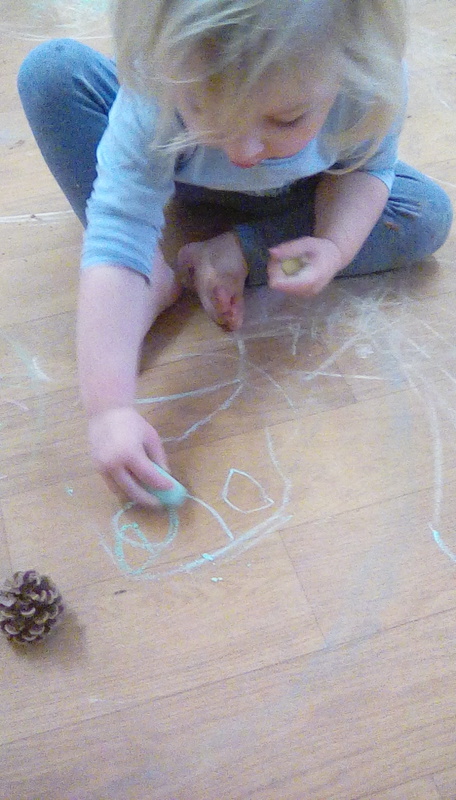 Watch this space for more examples of mindful moments at Little Star. 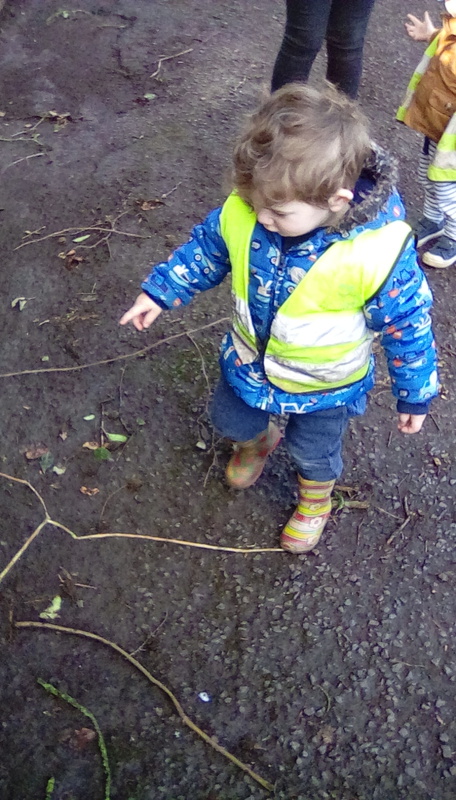 We’re going on an active bear hunt! 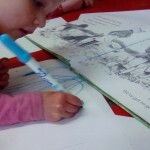 The strategies behind active story making are designed to make story telling come alive to children and make meaningful connections in their development and learning. 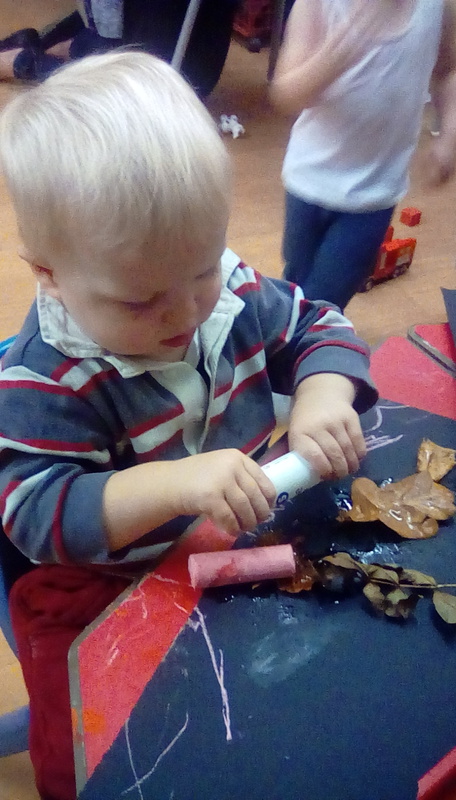 To this end, the Rising Star team have been finding a variety of different means and methods with which to bring the story of ‘We’re Going on a Bear Hunt’ alive. 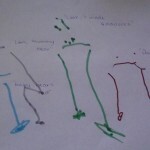 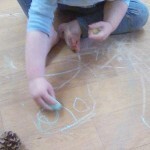 As well as the standard reading of the story, we add actions and write the story by drawing and making meaning of our marks (see below) but in addition they have been on a whirling swirling snow storm by using shaving foam and had to go through a deep cold river, swishy swashy grass and oozy mud on their walk down the lane. 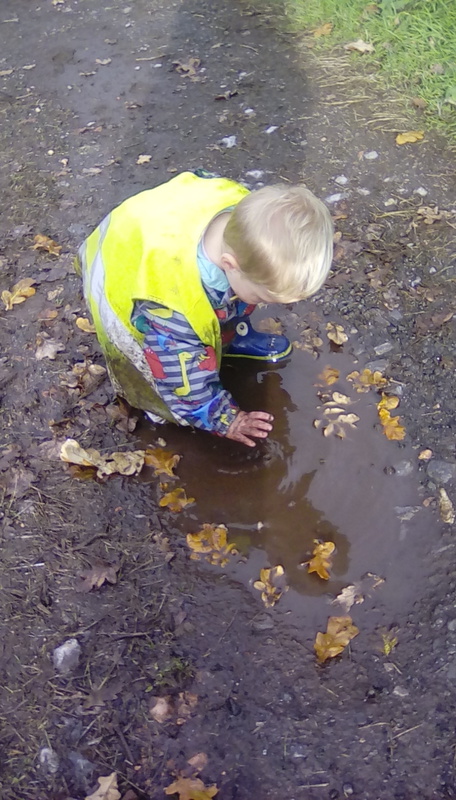 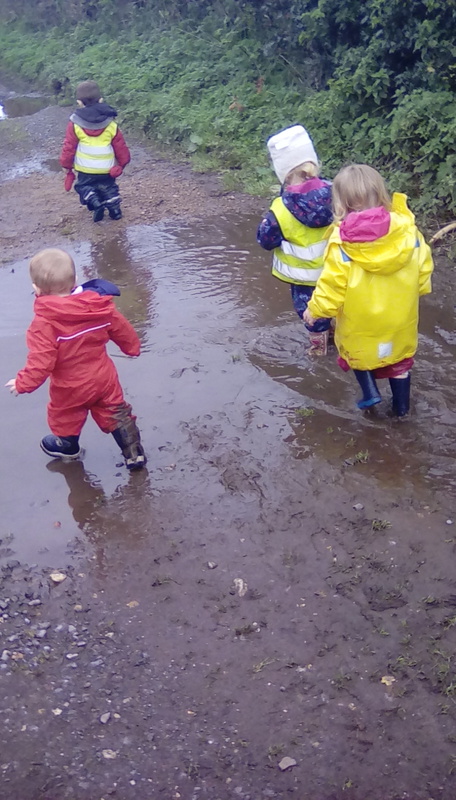 Such ways of providing ‘multi modal’ choices of play ensure that every child can shine in choosing their preferred methods of play and learning. 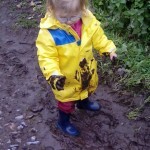 We’ve discussed earlier on this page and on the main What have we been doing? 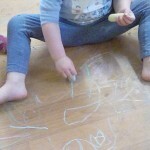 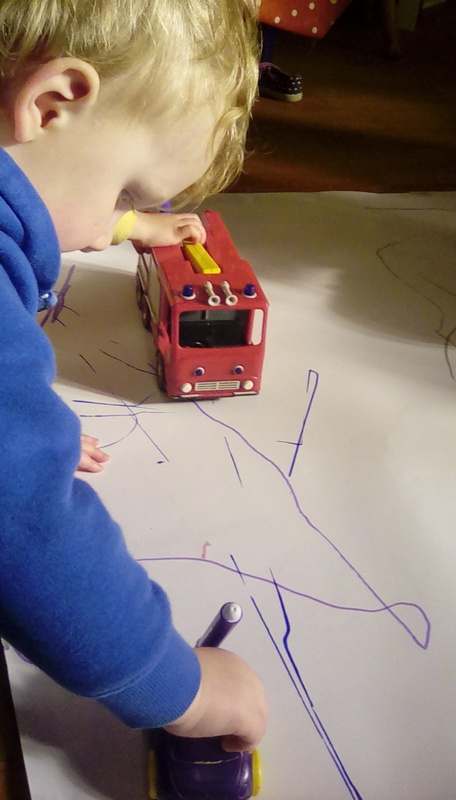 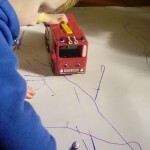 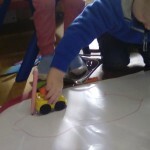 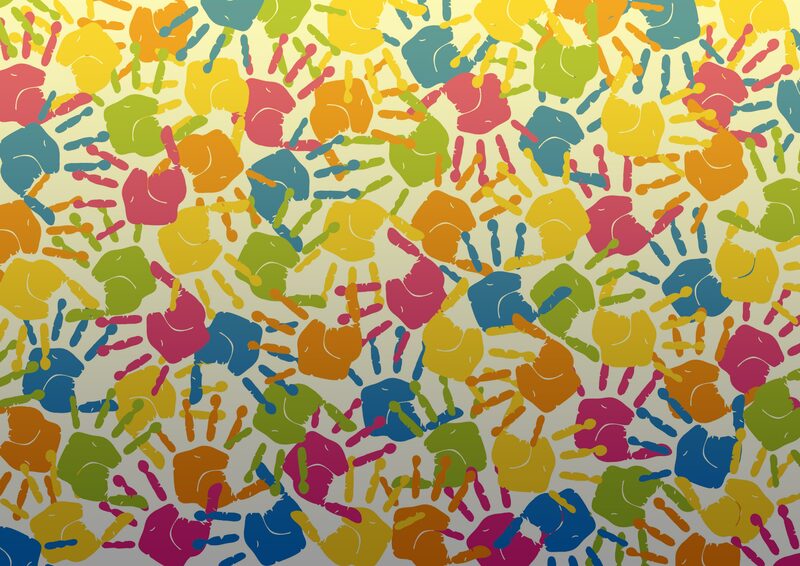 page the merits of scribbles and making marks in various forms and in order to do this, and develop a love of “writing”, children need to be given a variety of different motivations to make their mark and also different resources and impetus. 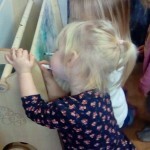 So in our Rising Star room we ensure they have mark making resources available throughout their continuous play: in the home corner, when playing with trains and trucks, in response to story (as they have been this week, drawing and “writing” after reading and listening to the story of ‘Bear Hunt’) and with our new addition of a baby and toddler height easel. 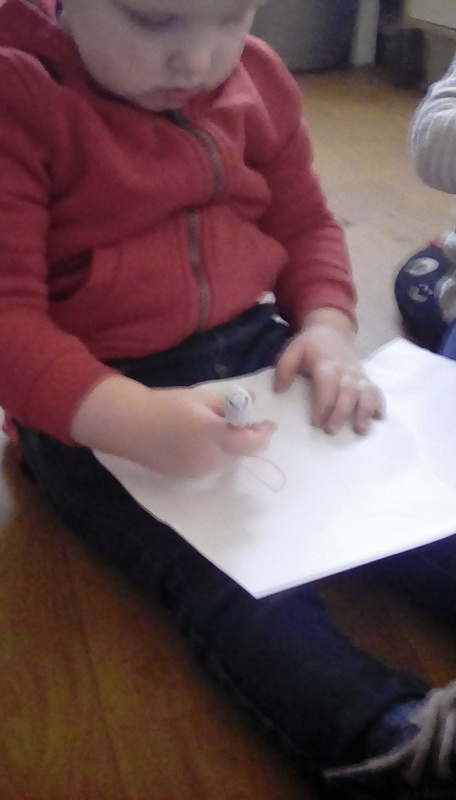 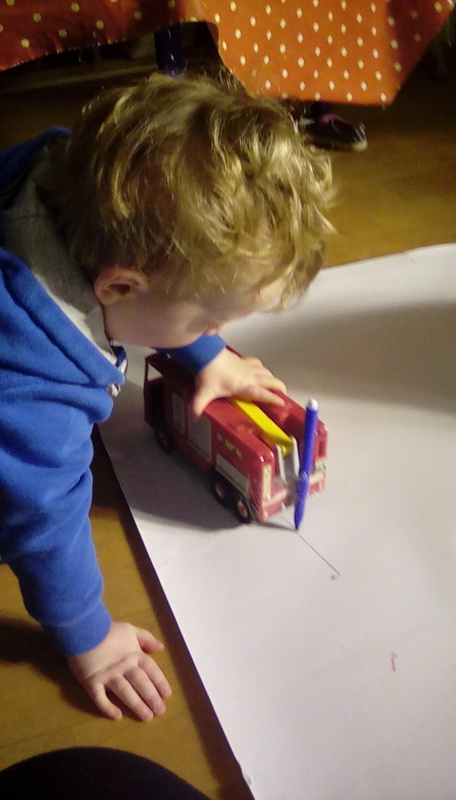 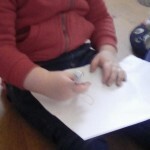 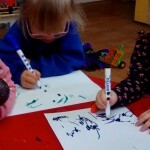 Writing in a vertical manner and with big movement also helps develop muscles in the arms and down to their hands and fingers and so works towards a good pen control as they get older. 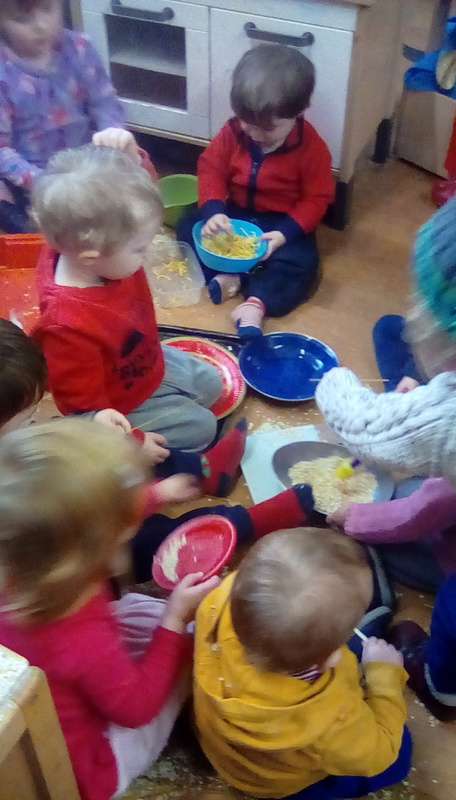 The Rising Stars have had a busy start to the term with us welcoming many new faces as they have made the transition from Little Star Babies in Paulton as well as other new faces amongst our youngest of babies. 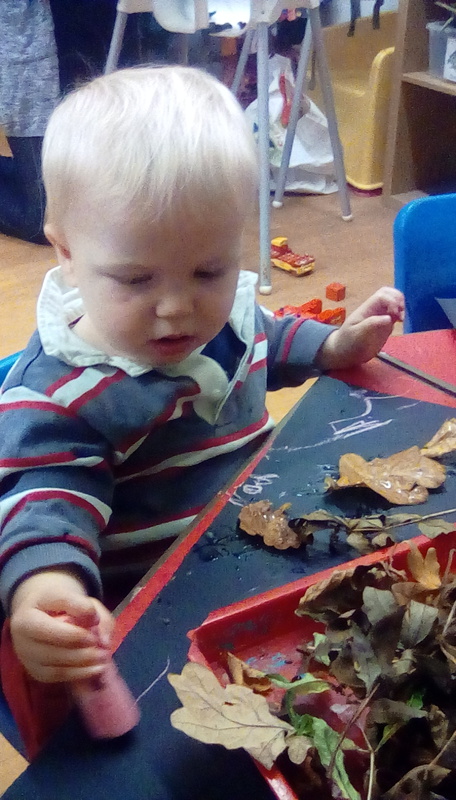 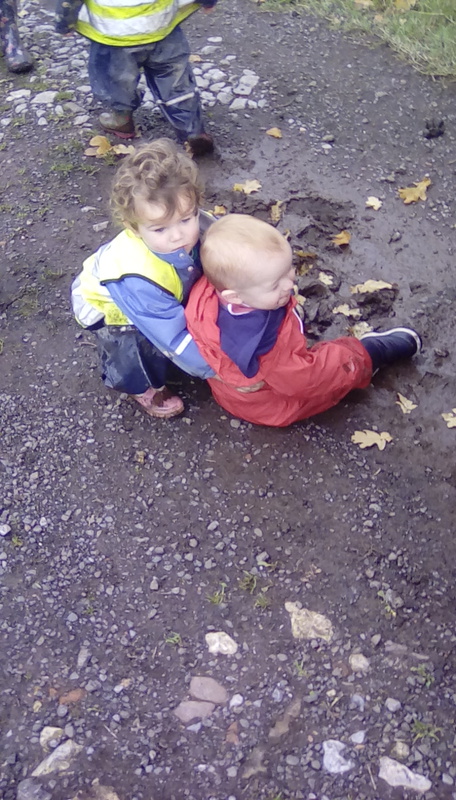 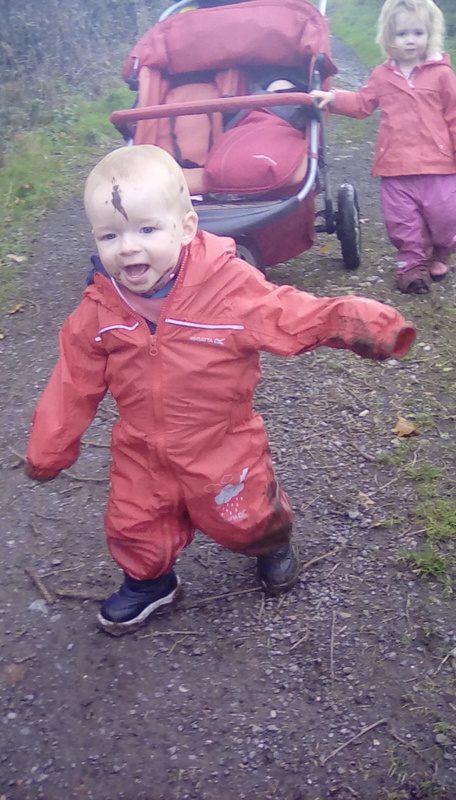 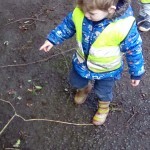 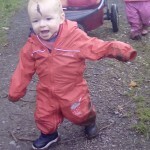 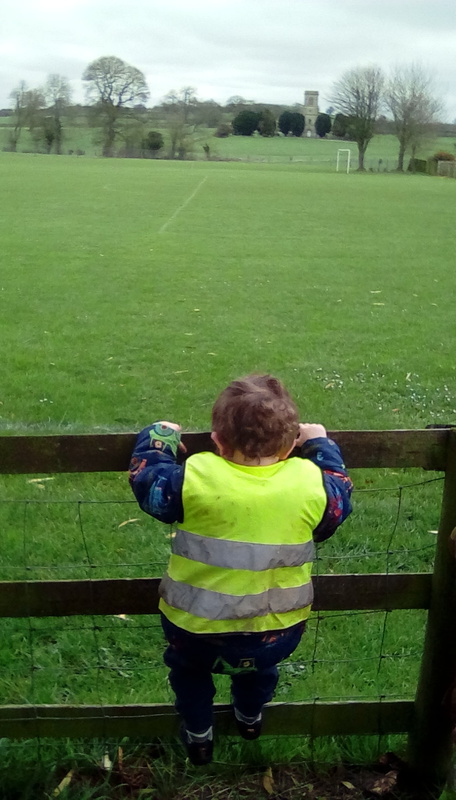 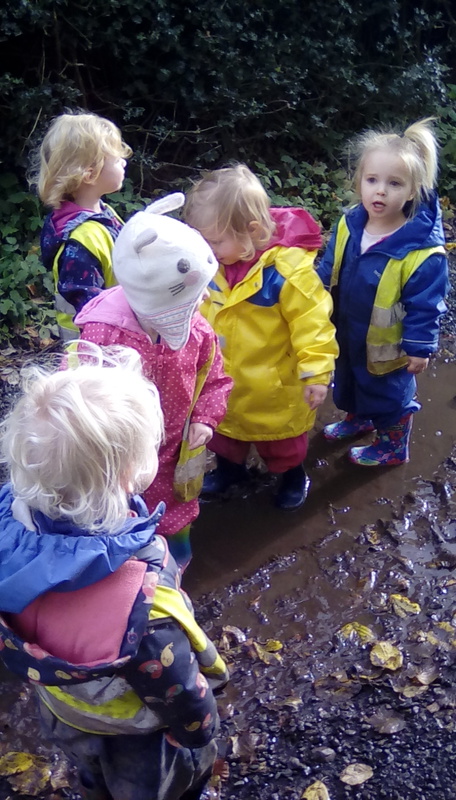 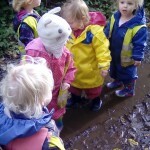 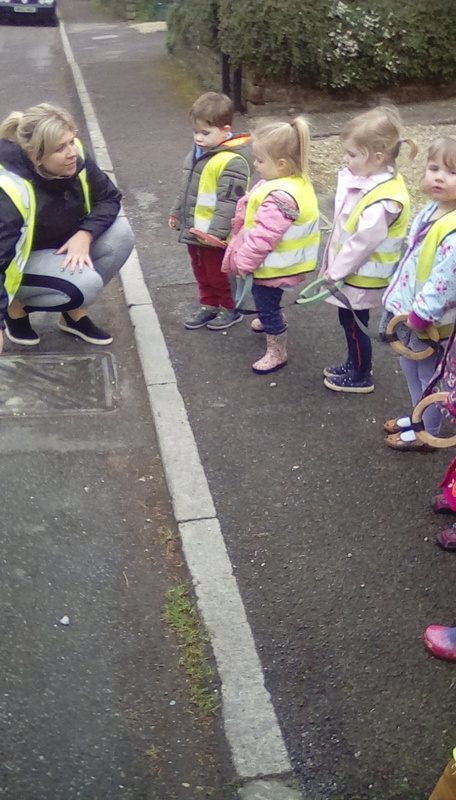 It has been heartening to see though that they have all made a fantastic beginning and have launched themselves into all that Little Star Farrington has to offer, including trips out to the woods and exploring the outdoors in the garden. 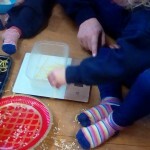 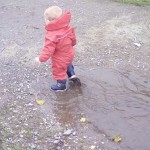 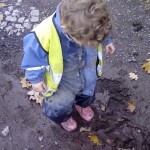 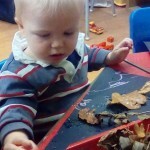 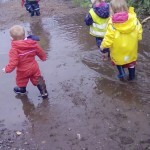 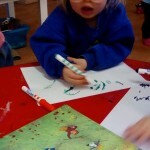 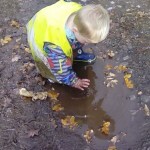 Whilst the main “learning” focus for the Rising Stars are the “Prime” areas of the EYFS (Personal, Social and Emotional’ Communication and language; physical development), on evaluating our practice it was evident that we may not be documenting as much as we could the specific areas of literacy and mathematics. 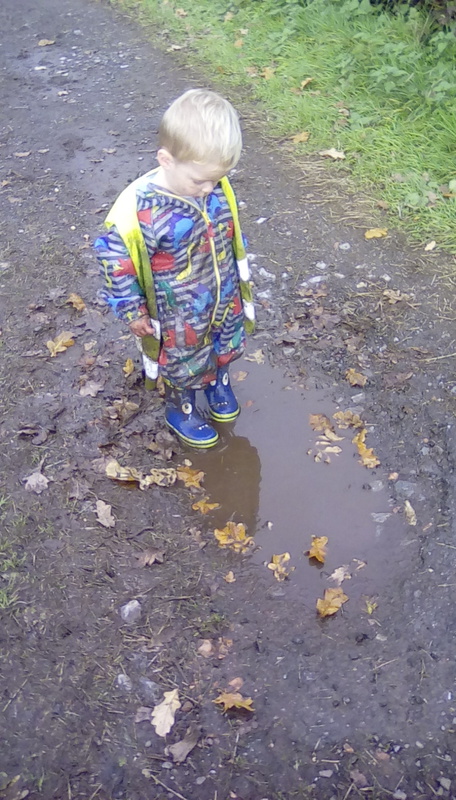 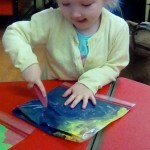 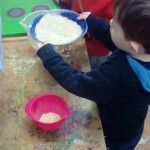 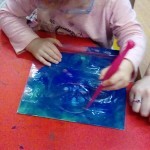 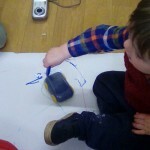 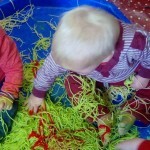 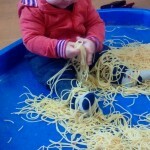 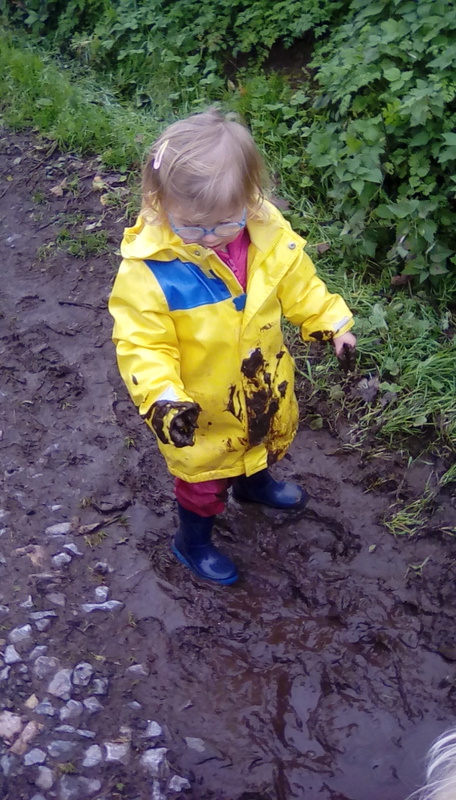 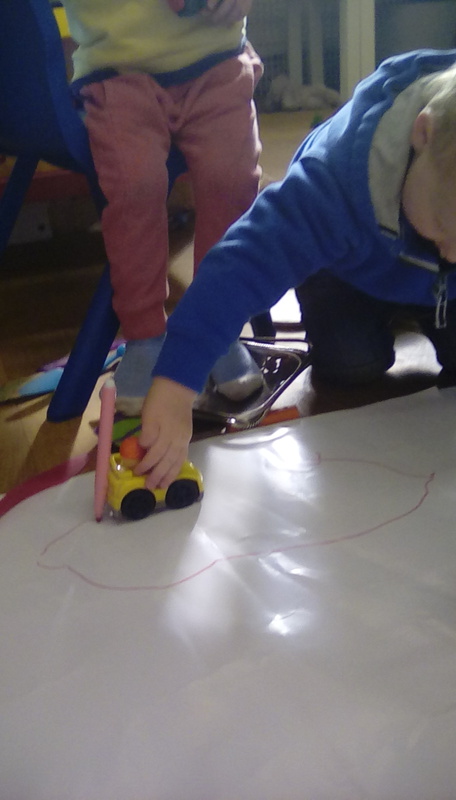 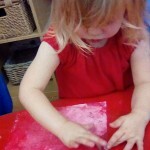 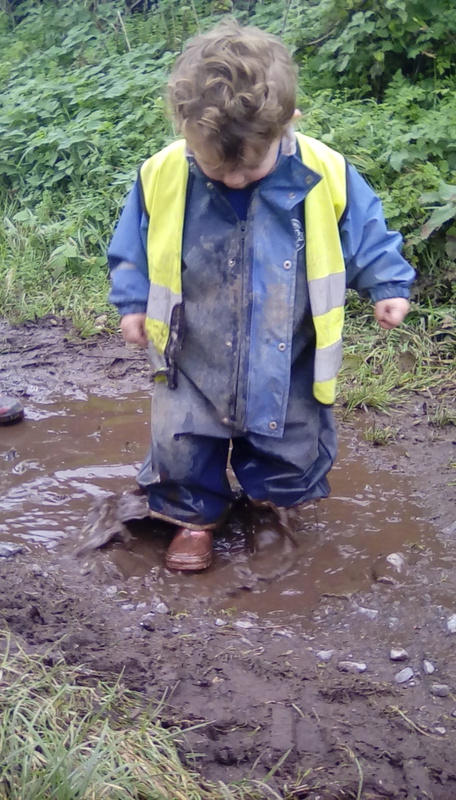 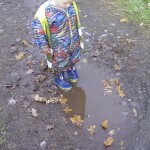 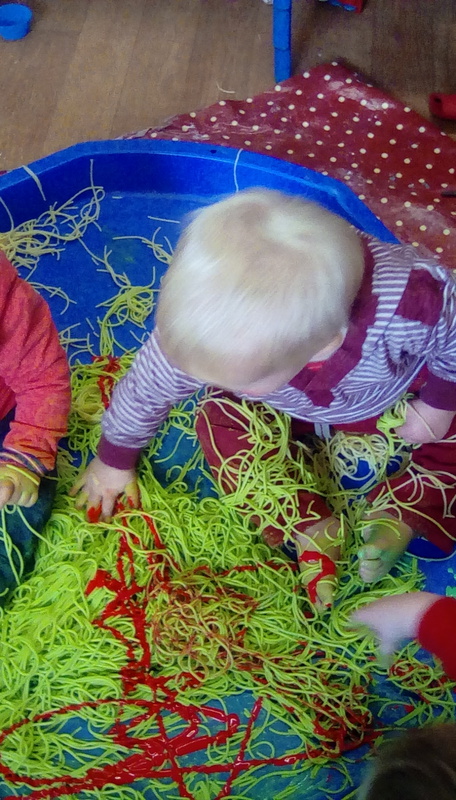 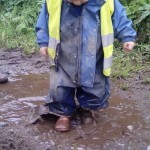 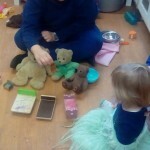 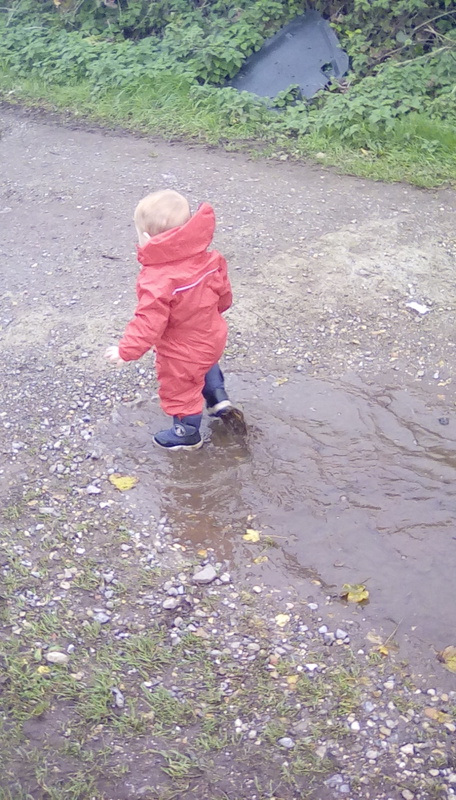 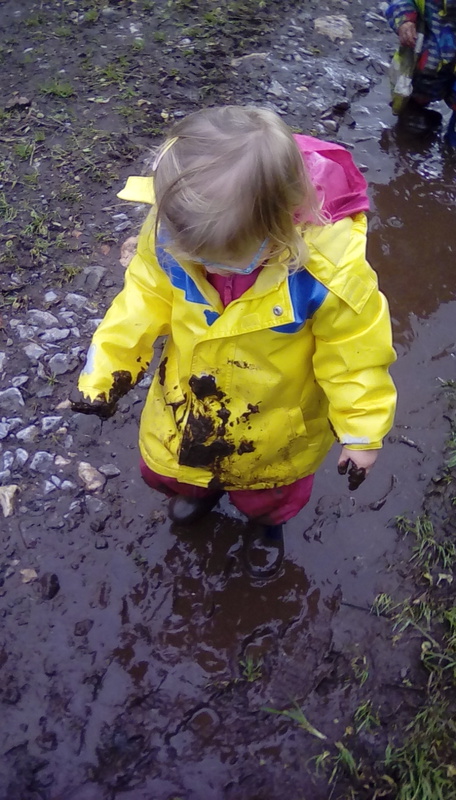 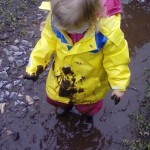 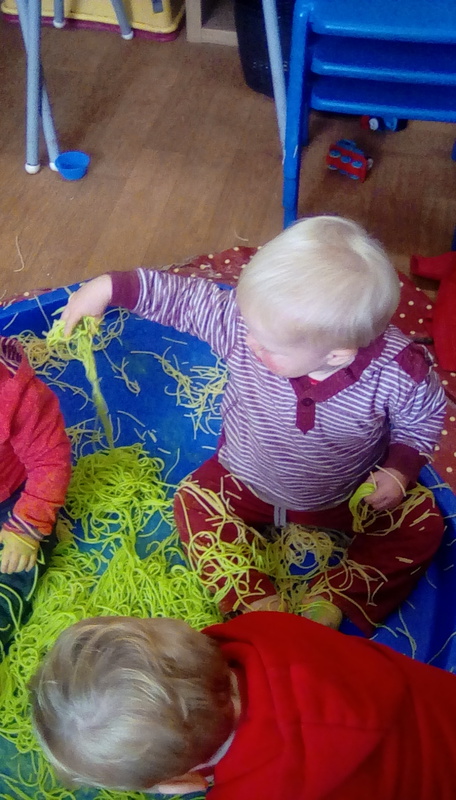 However this is not to say that they are not doing it (and for those who checked in last term we discussed in more detail how babies and toddlers explore mathematical and literacy ideas through messy play, painting, and general play). 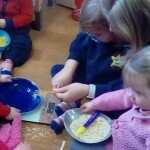 One specific method of exploring literacy skills that is used with the Rising Stars as well as their older peers is the methods of Active Story making and this term’s story of ‘Dear Zoo’ has allowed the children to bring the story alive with a range of props and telling the story with each other as well as emergent writing and reading as they use the story maps.